There are few designs as classic as the Weck Canning Jar. These Mason Jar-esque products have served as go-tos for canning for over a century now and it's not hard to see why. They're beautiful and simply made, and their thick glass construction, rubber gaskets and stainless steel clamps are timeless. Of course, these all-purpose tapered glass jars are perfect for more than just preserving, storing and canning. They've also become a great way to dress up a room with creative décor or create impressive packaging for your many homemade holiday gifts. 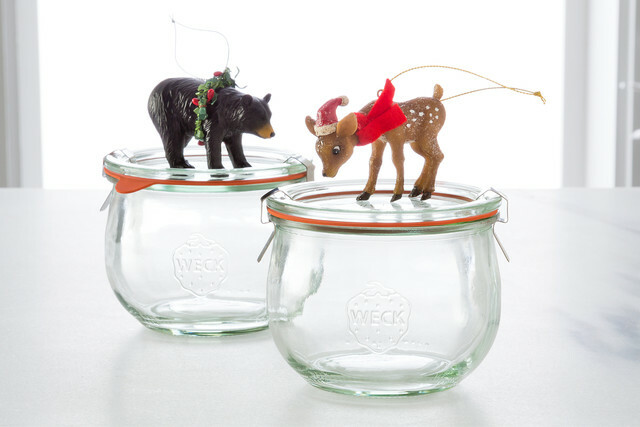 If you're wondering how you can use these Weck Jars to gift more creatively, add a little DIY to the holiday excitement or create homemade decor you can use year after year, we've got you set with seven takes on this classic! Reimagine your holiday party this year by incorporating Weck Jars into your serving mix. 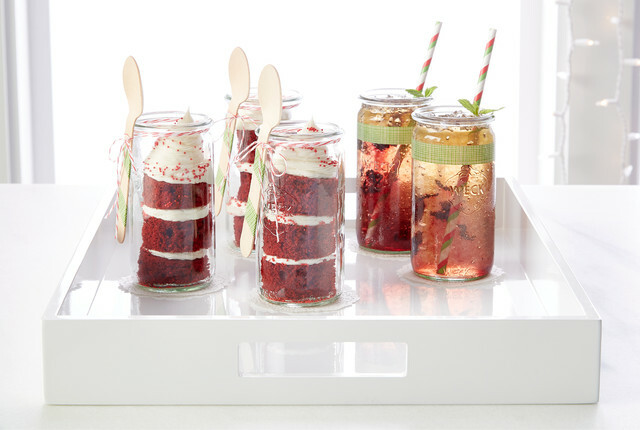 By using our Weck Zylinder Canning Jars, Washi Paper Tape and Holiday Paper Straws, you can create clever individual desserts and drinks! Use our White Lacquered Trays to help serve around the party. Preheat the oven to 350 F. Line an 11x17-inch rimmed baking sheet with foil, extending up and over the sides of the sheet. Spray the foil with nonstick cooking spray. In a large bowl, sift together the flour, sugar, baking soda, salt, and cocoa powder. In the bowl of a large stand mixer, combine the vegetable oil, buttermilk, egg, red gel food coloring, vinegar, and vanilla extract. Mix on medium-low speed until well-combined. Add the dry ingredients and mix on low speed until combined. Scrape down the bottom and sides of the pan with a spatula, then mix on medium speed until the cake batter is smooth and all the lumps of flour have disappeared. Pour the cake batter into the sheet pan and spread it into an even layer. Bake the cake at 350 F for 10 minutes, until it pulls away from the sides and springs back when lightly pressed with your fingertips. Cool completely before using. The cake can be baked several days in advance. If making in advance, wrap the cooled cake in cling wrap and freeze until ready to use. You do not need to defrost the cake before assembling the jars. Fit a piping bag with a large round tip, and fill the bag with some cream cheese frosting. Use a circle cookie cutter the same size as your jars, and cut circles out of the cake. Place a circle of cake in the bottom of a jar, and top it with a swirl of frosting. Keep layering cake and frosting until you reach the top of the jar. Sprinkle top layer with red sugar sprinkles. Place the hibiscus and cinnamon stick in a large jar or bowl. Add water. Cover and refrigerate overnight (8 to 12 hours). Strain out the solids and serve over ice with a squeeze of lime, if desired. Store the brewed tea covered in the refrigerator for up to one week. If you want give your party guests, coworkers or family members a homemade treat to take, think about making this Holiday Mix in bulk and dividing into our Weck Saftflasche Jars! Personalize each one with twine and a tag with a sweet note for each recipient or for the season. Mix equal parts. Each glass jar holds approximately 2 cups of mix. 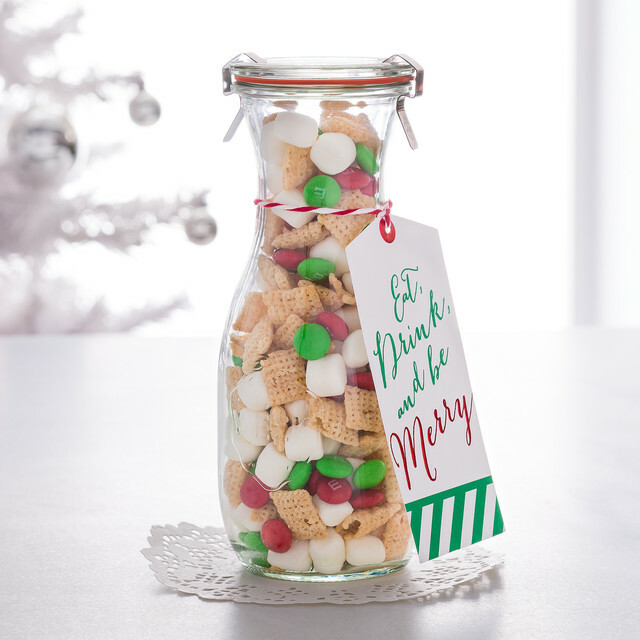 Create a festive centerpiece for any holiday party with these glass jars and just a few simple steps. To create the canvas, use your favorite gift wrap (we chose our Nantucket Red Treeless Gift Wrap), and cut to desired length depending on where you're wanting to display. 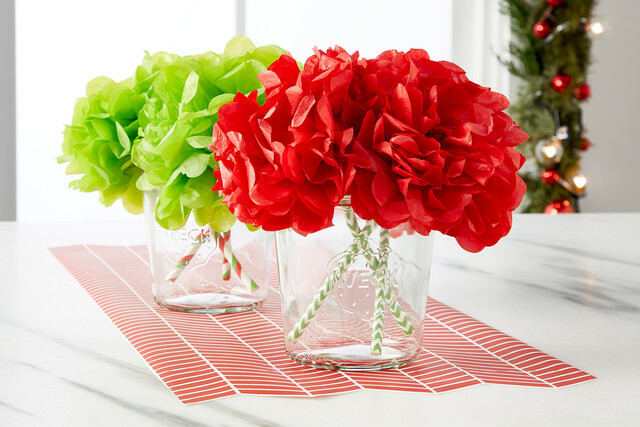 Take our Tissue Paper Pom Pom Kits and fan them out to get the full look. Take the strings attached and string them through and use some double stick tape to keep them adhered to the bottom of the glass jars. You've surely seen the Mason Jars Light trend on Pinterest and just about everywhere else. 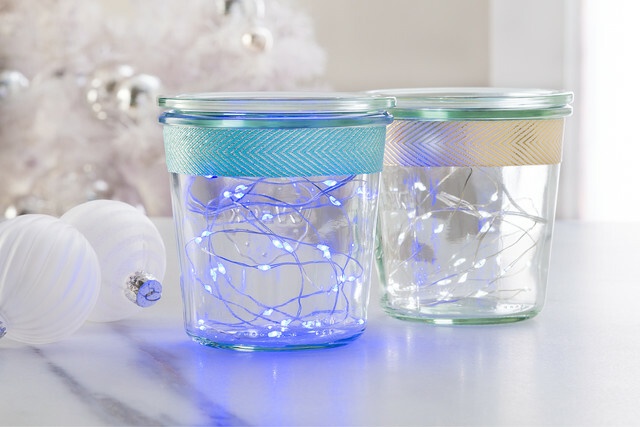 Create our holiday take on the look with our Weck Sturz Jars and Cooler Brightz lights! We concealed the battery for the Cooler Brightz lights by attaching it to the top of the lid with Double Stick Tape. Then we added a pop of wintery color with our Metallic Aqua & Silver Ribbon and Gold Foil Chevron Ribbon. These DIY candle holders are perfect to set atop tables at your holiday party or to gift a set to friends and family. They're so simple to make, too! There are two ways to create these candle holders. To ensure that the wax fills the entirety of the jars that you're using (we used our Weck Mini Sturz Glass Jars), find a candle making kit and melt the wax to your desired jar size. For an even easier step, purchase votive candles that fit close to the Weck Jar you're using. 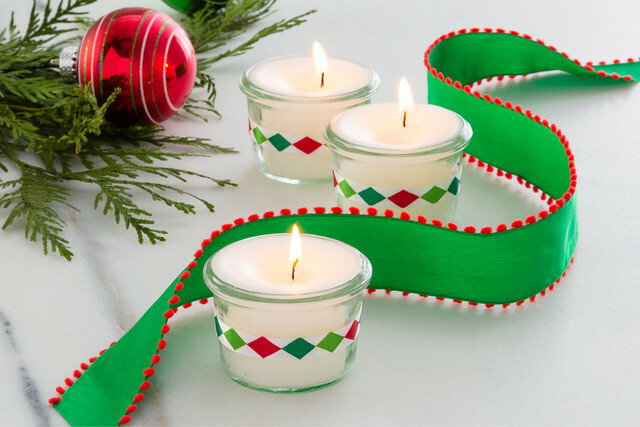 Finish off each jar with our Christmas Diamonds Satin Ribbon and a little Double Stick Tape to secure. 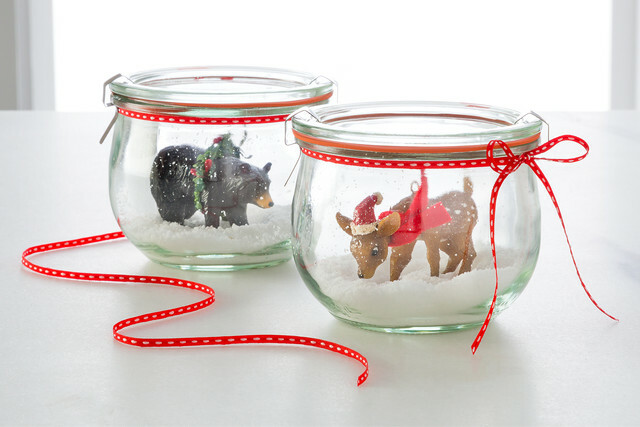 Homemade snow globes might sound hard, but with our Weck Tulpe Jars, Ornament Tie-ons and a little Double Stick Tape, they'll turn into a winter wonderland in no time. Shake lightly to see it snow! Who could resist this gift? It's easy to make, take, and it keeps giving throughout the year! To create your spa in a jar, pick a few favorites of the recipient you have in mind. We filled our Weck Sturz Jar with nail polish, cotton swabs, lip gloss and nail accessories. Seal it with our cute Snowball Ribbon and tag to add the final touch. It's the perfect gift for any teen, and every beauty and spa lover! We hope you've been inspired by a few of our takes on the traditional canning jar. Let us know which is your favorite in the comments and tell us any ideas you have for your fabulous Weck Jars this holiday season!